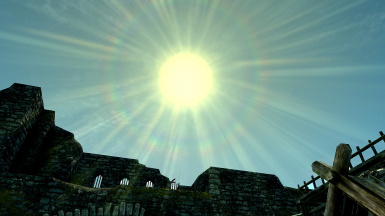 I hope people enjoy my sun/sunglare addition to Skyrim. 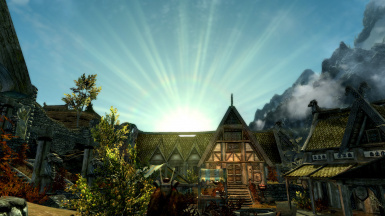 The vanilla game lacks a bit of visual sparkle. I made this mod to address that weakness. Enjoy! 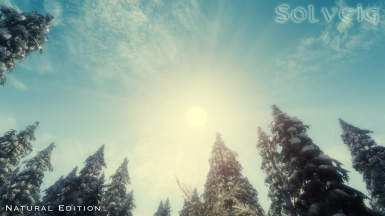 UPDATE: SOLVEIG NATURAL EDITION is now available. 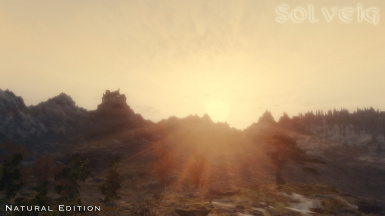 This is a cinematic sunglare, but with a more realistic appearance. 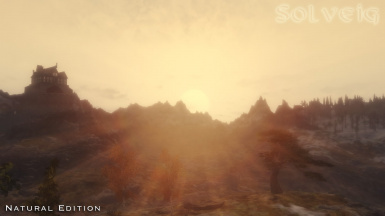 For people who like a more "realistic" sun glare in their game. 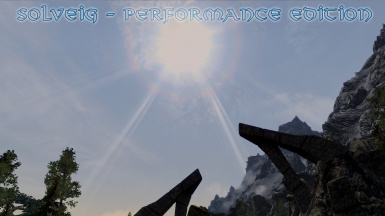 UPDATE: I've added the Solveig Performance Edition textures for download. 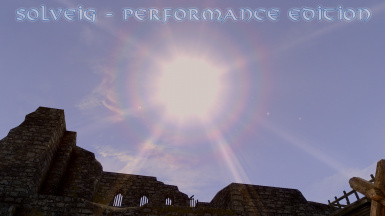 This is a performance friendly version that preserves the dramatic rainbow effect while having fewer sun rays. 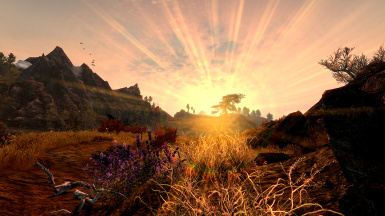 I've been using Climates of Tamriel (since Pro80 added his patches), so I made this version to work with CoT. I hope people enjoy this new version. 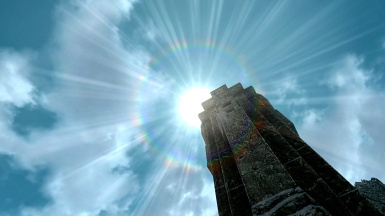 You can never have too many sunglare options. 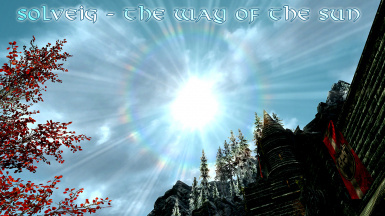 Using the Natural Edition in special edition with obsidian weathers and Re-Engaged ENB. I Like it. 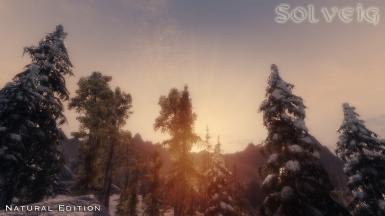 I keep getting messages that my mod organizer is not set up to run Skyrim even though I'm downloading this mod for special edition. I'm considering a manual install but I would like some confirmation that it is safe. 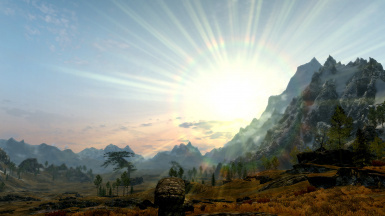 Please answer back I loved this mod when I used to play Oldrim! It's just a simple texture replacer, so it's perfectly safe to install and uninstall as you like. 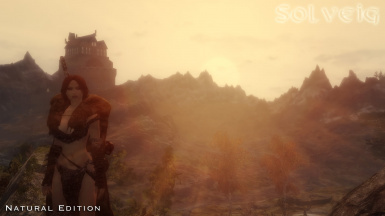 It should work just fine in SSE. I started using this in a brand new install, and I'm blown away. 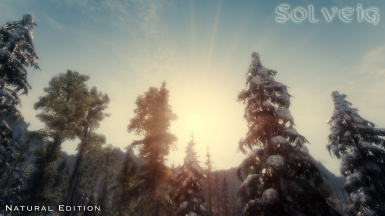 Even though Vivid Weather is apparently incompatible with sunglare mods, I figured I'd throw this one into Bain, to test it out.. since it's easy enough to remove if not. So far.. SOLVEIG and Vivid Weather have actually performed beautifully together. I'm running them with FXAA Post Process Injector, and the effects are lovely. Feel free to check my screenshots, several show it off. Also, yeah, it's just a texture, so if you install it with a mod manager, you can easily remove it should you wish. A quick update to my experience with this awesome sunglare..
Any of these suitable for NLA? Thanks. I should think so.... it's all a matter of what you like frankly. Hey Gamwich, will there be a performance version for SOLVEIG Natural Edition? Don't think it's needed frankly. 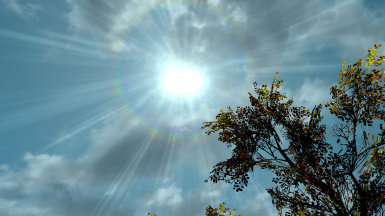 It's just one texture and it's loaded just once during the day (since it's a constant object). 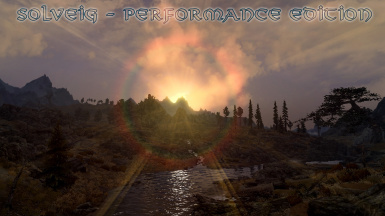 Therefore, it doesn't have much effect on performance. Making it smaller, will just introduce more banding artifacts. Allright, thanks for the reply! P.S. At first, I went for the natural version, thinking that the cinematic was too flashy, but I ended up finding the former too, well, natural! Who would've thought? Anyway, the cinematic version definitely gives that visual sparkle that I wanted! Thanks, again! 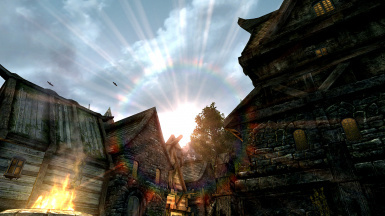 Yes, it is a fantasy game, so some people don't care if it's completely natural looking. I tried to offer options for both realism and fantasy. 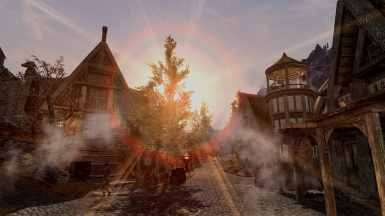 i wonder if its possible to add mini-sunglare-like effects when looking directly at other light sources at night, like torches and candles... i always noticed irl that if i stood in the street at night and looked up at a streetlamp i'd see sparkles almost identical to what youve created here. Looks gorgeous. It's such a wonder how such tiny details can make the game look completely different. 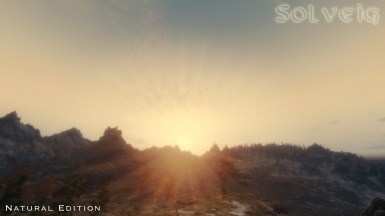 Well, the sun is a pretty big "detail" it's just very far away. Thanks so much, i like it!! 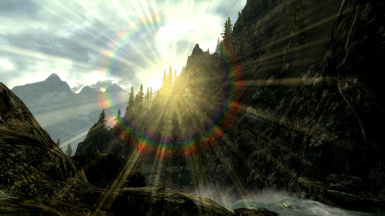 Thanks, but I noticed your screenshots have a lens flare, but my sunglare texture doesn't have one. 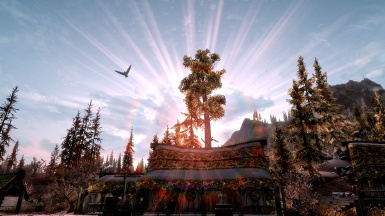 I guess it's the ENB i use..?! OK, that explains it. 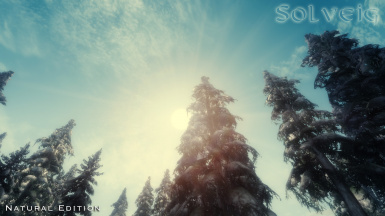 You must have the ENB sunsprite texture active then. You can turn it on and off in your enbseries.ini file. Sorry to bother you: you mean this in the ini?